Will Crimea’s ‘energy bridge’ save it from dependency on Ukraine? Russian President Vladimir Putin at the launching of the first stage of a power bridge from Russia to Crimea, Dec. 2, 2015. Electricity in Crimea has been partially restored: On Dec. 2 an underwater cable linked the peninsula’s electricity system with a Russian electrical grid. RBTH finds out why the Russian authorities were unprepared for the peninsula's electricity being cut off by Ukrainian activists and asks whether the energy bridge will save Crimean residents from other infrastructure failures in the future. The solemn inauguration of the so-called “energy bridge” along the bottom of the Kerch Strait on Dec. 2 was a joyous occasion for Crimeans, who had been living without power for more than a week after Ukrainian activists sabotaged pylons carrying power lines to the peninsula from Ukraine’s Kherson Region. However, for many it still has only symbolic significance. Out of the 500MW-power capacity that Crimea needs (it can produce another 500MW by itself) it now has only 200, since the first stage that was launched is only working at half-capacity. Moreover, many are worried about further subversive activities on the part of Ukraine. "Whatever the Russian Federation does to organize and develop Crimea, it will be blown up, pulverized, destroyed and abandoned. By those who will not reconcile themselves to this… Someone will certainly swim up in a diving suit, lay an explosive device and blow it up," predicted Ukrainian journalist Matvei Ganapolsky, writing for Ukrop.org, a Ukrainian news website. Experts believe that even if Crimea solves its urgent electricity problem, its water supply infrastructure will remain vulnerable. Last summer in August many Crimean resorts experienced an ecological catastrophe when supplies of fresh water ran out. The Crimean electricity network was completely shut down in the early hours of Nov. 22 after a group of Ukrainian and Crimean Tatar activists opposed to Russian rule in the region blew up the power lines going to Crimea from Ukraine, plunging the peninsula into darkness. At that moment, in accordance with an agreement signed with Russia, Ukraine was supplying up to 80 percent of all the energy consumed by Crimea. Strangely enough, considering the tensions between the two countries, the incident took the Crimean authorities by surprise. According to Russian Deputy Energy Minister Andrei Cherezov, out of the 94 supermarkets on the peninsula only 10 have autonomous power supply sources. In such a situation the authorities were forced to supply power only to facilities providing life-sustaining activity (hospitals in particular), while other consumers (including clinics) were switched to rolling blackouts. The local economy came to a standstill. Residents began to complain that there was practically no mobile phone connection, that lights worked only an hour a day, that gasoline was about to run out and that cars were being pushed to the gas stations. The failure to follow the scheduled rolling blackouts (which has made Crimeans extremely angry) and the unsuitability of the diesel generators to work in emergency mode (out of the 15 diesel generators supplying heat for Yevpatoria only two were working fully) resulted in the dismissal of Crimean Energy Minister Sergei Yegorov along with his deputy, Yevgeny Demin. The government had to immediately transfer a large volume of diesel generators onto the peninsula and speed up work on the so-called "energy bridge," which would lay an electricity cable from Kuban (in the south of Russia) to the Crimean Peninsula. Why wasn't the cable laid earlier? Many observers, and especially the residents of Crimea, are irritated by the Energy Ministry’s slowness and are asking why the cable was not laid earlier, as it is now more than a year and a half ago since the accession of the peninsula to the Russian Federation. 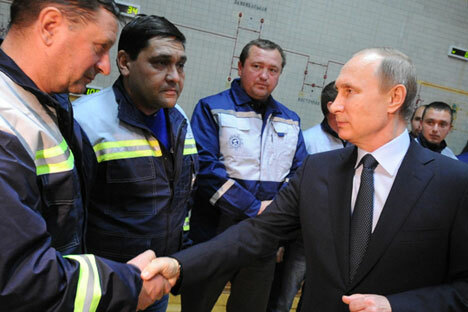 According to Russian Energy Minister Alexander Novak, the problem was that the energy bridge did not only entail laying the cable along the bottom of the Kerch Strait (4 lines, 13.5 kilometers each), but it turned out that Russia does not produce cables of such length and most of Russia's foreign partners refused to supply the cable because of economic sanctions related to the takeover of Crimea in March 2014. In the end the cable was bought in China but the Chinese ship from Shanghai arrived in Kerch only on Oct. 11and work on laying the cable began on October 18. Moreover, the energy bridge entails the construction of high-voltage lines and new substations in the Krasnodarsky Territory and in Crimea, and the overall cost of the project is estimated at about $700 million. As a result, Russia is working on solving all these problems – but not as fast as it would like. The situation with the water is much more complicated. On April 26 2014, Ukraine blocked the locks of the North Crimean Canal, via which water from the Dnieper River was channeled to the Crimean peninsula. Since that time Moscow has provided only temporary solutions. Crimea consumes about two billion cubic meters of water a year, out of which 80 percent is used for agriculture. In normal natural conditions Ukraine provided one billion cubic meters of water along the North Crimean Canal and the rest flowed into reservoirs from local wells and runoffs. The Russian Agriculture Ministry estimates that Crimea's agriculture alone could lose up to 120,000 hectares of terrain due to water supply problems, which would cost 5 billion rubles ($74 million) and 180,000 jobs. Creating its own water intakes will not solve the problem. According to Crimean Ecology and Wildlife Minister Gennady Narayev, three new intakes, which will be built by the end of the year, will produce a total of only 195,000 cubic meters daily. The modernization of Crimea's water supply infrastructure (74.4 percent of which was in need of repair by 2013, and whose water supply networks lose 20-25 percent of the water) will also not help Crimea. Some have suggested solving the problem through additional pumping from subterranean sources. A year ago the Crimean authorities noted that the north-eastern part of the peninsula may contain large underground reserves of fresh water. "It is important that these wells are renewed. The water in these sources, if used reasonably, is inexhaustible," said Rustam Temirgaliyev, First Deputy Chairman of Crimea's Council of Ministers. Meanwhile, Chairman of the Ecology and Peace Association of the Crimean Republic Viktor Tarasenko affirms that artesian wells will be effective only for 2-3 years, after which the ground will become salty. As of today, the only alternative to the North Crimean Canal may be the construction of desalination plants (the overall cost of the project, including infrastructure construction and other work, may total $800 million, while the cost of desalinated water is $0.20-0.35 per cubic meter) or laying a water pipeline from Kuban (the cost of which is estimated at more than $1 billion). However, these projects are not even being studied in preliminary discussions.